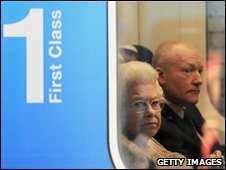 MPs may no longer be allowed to claim first class rail journeys on expenses - to the disgust of some. But are those in standard class really any different from travellers who have paid a premium, as one suggests? It's the comfort of extra legroom for Labour MP Tom Levitt. The guarantee of a power socket for laptops for Conservative MP Ann Widdecombe. And for Liberal Democrat Sandra Gidley, travelling in first class makes her feel safer at night. For these MPs, and more than 50 others, have lodged objections to proposals that they no longer be allowed to claim for first class train travel, except in "exceptional circumstances" such as journeys longer than two and a half hours. Among the most vocal critics of this plan is Conservative MP Sir Nicholas Winterton, who has suggested passengers who travel in standard class are "a totally different type of people". But research indicates he is wrong. The most obvious difference between someone in first and someone in standard is the price they have paid for their tickets. And even that may only be the narrowest of margins, thanks to off-peak deals and advance tickets that can bring the cost of premium travel way down. The consumer research company Mintel has studied the profile of train passengers in standard and in first class in the 12 months to November 2009, and has found little difference. "If this MP believes that trains are ghettoised into different classes of people, then he's wrong," says Tom Rees, a senior travel analyst at Mintel. "It's not necessarily true that you do get a different class of people in first, because the research suggests they're scattered across the train." His research shows the social group most likely to travel by train for work or pleasure - excluding commuter-length journeys - are professionals. Which means the person next to you on the train is likely to be a professional, no matter which carriage you choose. Another argument used by those who favour first class travel on company or taxpayer expenses is that it offers a more productive working environment. With plenty of elbow room, ample workspace, power sockets and a more business-focused clientele, there is some truth in this. "You're surrounded by people who are quiet and less likely to intrude on what you're doing, versus pot luck between an empty carriage and standing with your head in the luggage rack in standard class," says one consultant who travels first class on a regular basis. "If you could have standard class and be guaranteed a table - that would almost do me. But then you'd want to be sure you'd want to get confidentiality." He argues it is more cost effective to travel first class, because the extra money spent on a ticket is made up by the fact that those hours on the train are spent working productively. And there is an academic study that has put a value on this time - about £31 an hour, says Glen Lyons, a professor of transport and society at Bristol's University of the West of England. "If you're a senior employee then your time is at a premium, both for you and for your employer," he says, adding that the hierarchy of the office can be applied to train carriages. "If you've got people who are in a position of privilege, they often get their own office, and aren't in an open plan office like everyone else." But what happens if first class is done away with altogether? In 2003, Chiltern Trains did just this and since then has received very little in the way of negative feedback, and no fall in passenger numbers. "Listening to our passengers, they felt it was unfair that at times there were empty seats in first class while other people were standing," says regional manager Michael Campain. The company operates routes between Birmingham and London, and commuter services around the Midlands. "On our services to Birmingham, they've got carpets, they've got nice seating. The legroom is certainly greater than some train operators. And we make sure that every seat is lined up with a window," says Mr Campain, who adds that several MPs use its services without complaint. And while first class is no more on Chiltern trains, quiet carriages remain in place, allowing people to work in peace. But rail economist Jeremy Drew warns that ditching premium carriages can lead to a loss in revenue. "First class is a way of segmenting the market so you can charge an awful lot more for the people who can afford to pay it," he says. As well as having the space to feel like a mobile office, first class is about making those passengers who have paid more feel that extra bit special. Virgin Trains is among the companies who like to offer customers the choice of paying a premium for extra legroom, free wi-fi and complimentary food and drink. Spokesman Ken Gibbs says no one type of person uses first class. During the week it tends to be business travellers; at weekends, cheaper deals have led to a surge in leisure travellers. For those who do opt for a first class ticket, it is all about receiving a certain level of service, says sociologist Alan Urry, of Lancaster University. "There are people at your beck and call, you can sit at the seat and expect a service delivered... your trivial needs will be met, like an extra glass of orange juice." For some, he says, being in first class offers the feeling of being in a position of social dominance. The extras - and the smiles that come with this level of service - help reinforce this sense of importance. For those used to having things done for them, "there are always people at hand if there's a problem, if there's an uncertainty." Whatever the reason, for some having a first class ticket is a price worth paying.